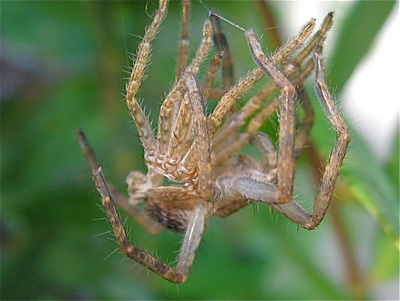 "Attention all arachnophobes," warns Ruth Cooper. "What's scarier than an eight-legged spider? A sixteen-legged one!" "It isn't really, I was just lucky catching this small hairy garden huntsman spider in the process of moulting. I understand that spiders do this mainly at night for their protection, but I guess this fellow just couldn't wait." "I captured the shot on my hand-held pocket-sized Canon Ixus 800 IS, set on the digital macro setting."